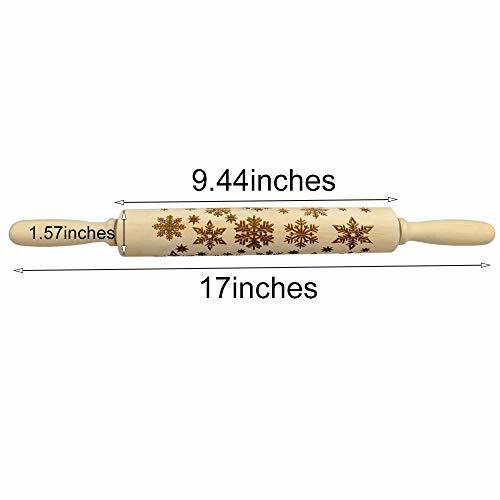 MATERIAL: Embossed Rolling Pin is made of durable, moisture-resistant hardwood with engraved snowflake pattern. 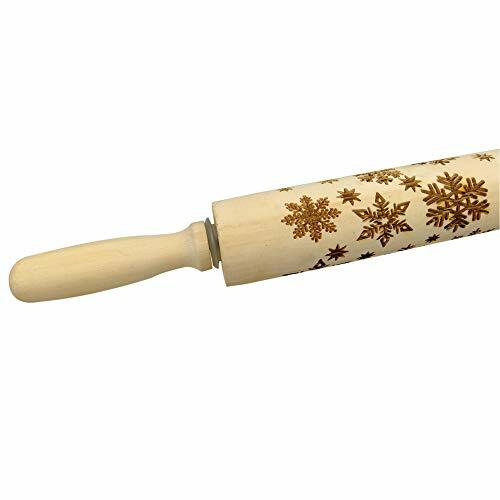 PACKAGE: 1pc Wooden snowflake handle rolling pin. 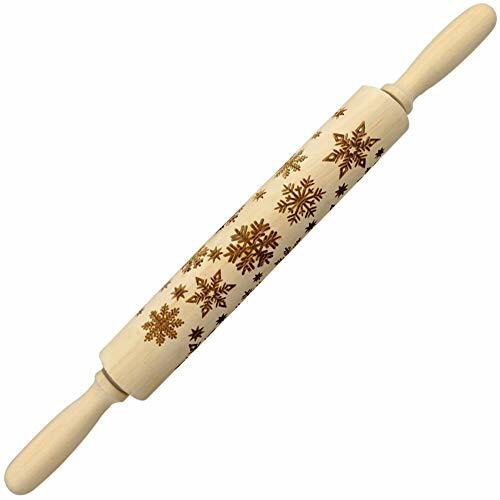 SIZE: The total rolling pin measures 17inches(43cm) and the embossing area is 9.44inches(24cm) with a diameter of 1.57inches(4cm). EASY TO USE: It is an important kitchen decoration tool which can decorate your homemade cookies, cake, pie, biscuits, dough, pastry and clay. Baking with embossing rolling pin can be a fun, especially with your family, kids and friends. 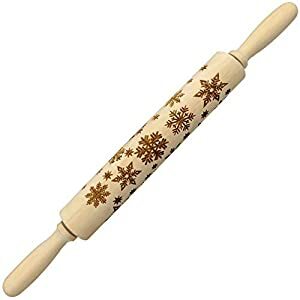 1.The snowflake pattern on the rolling pin is caved deeply, when using it, please press it hard and then the pattern can be engraved very well. 2.Clean your rolling pin after using it to prevent any sticky dough from adhering to the surface. 3.Never leave your rolling pin soaking in water. Do not wash your rolling pin in the dishwasher. Dry your rolling pin thoroughly. 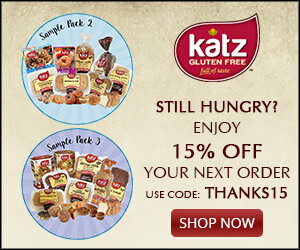 4.Since our product is manually measured, there may be a slight error. 5.Due to differences between monitor displays, actual color may be slightly different from picture. MATERIAL: Wood PACKAGE: 1pc Wooden snowflake handle rolling pin SIZE: 17inches in total. Roller diameter: 1.57inches, print length: 9.44inches, handle length: 3.54inches. 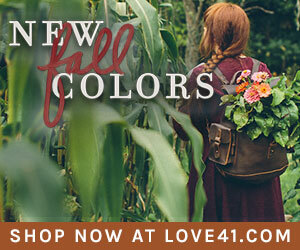 FEATURES: Non-stick, durable, reusable, comfortable, smooth, high-quality, exquisite craft. 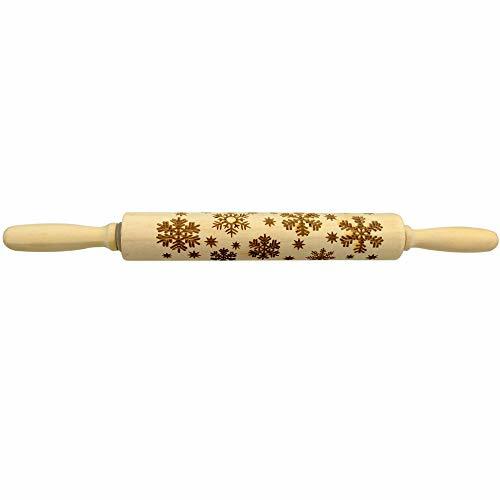 WIDE RANGE OF USES: This wooden rolling pin with cute and unique snowflake design can be used for pasta, cookie dough, pastry, bakery, pizza, fondant, chapati and much more. 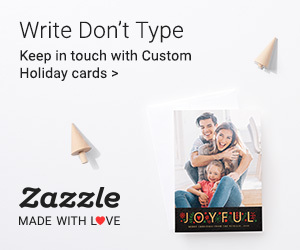 Perfect gift for birthdays, house-warming, Christmas, New Year's Eve, Mother's Day, Thanksgiving Day and other special occasion.